If you’re looking for an authentic Japanese inn, you can’t go wrong with Ryokan Katsutaro. 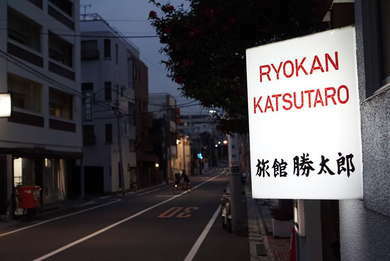 Set off on a nondescript street, the Ryokan offers traditional style accommodations in an incredibly simplistic setting. There’s not a ton going on here, but the location is a big selling point as its close to many major attractions and subway access. There are only eight rooms in this small inn, but they’re all relatively spacious. Only four of the rooms have en suite baths, so it’s important to book ahead of time. Rooms are traditionally styled with tatami mat floors, rolled up futon mattresses, yukata pajamas, and hot tea. En suite bathrooms are pretty small as the sink, shower/tub combos, and toilet are practically squished together. If you get a room with no bathroom, you’ll find a shower next to a coin laundry. The small lobby area has a few seats and a single wooden table. There’s a computer with internet access for guests in addition to a bevy of guide books and other travel pamphlets that are useful for exploring the neighborhood. The ryokan also has bikes that you can rent. Take a stroll through the Ueno Park right next door. It’s really easy to walk around this quiet neighborhood and there are dozens of attractions nearby. The Ueno Subway Station is also a short walk through Ueno Onshi Park that makes it easy to truck around the city. Soba lovers simply must go to Yabu Soba (5-minute walk) as they’ve been in business serving slurp-worthy noodles for more than 100 years. If gyoza is your jam, check out Shoryu (5-minute walk) for oversized dumplings that will invariably burn the roof of your mouth. Do you want to experience the perfect beer pour? Then check out Kirin City (5-minute walk) where expert bartenders use a three-step process to achieve suds nirvana. Simple and authentic, this ryokan has no frills and the price point to match. It’s small and personal and in an area that is ideal for exploration. English is a bit of a struggle – so come prepared with Google Translate at the ready – but it will only bolster the authenticity of the experience.